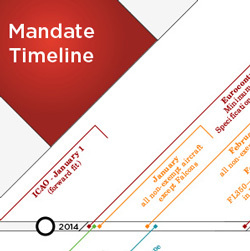 Click below to download Duncan Aviation's NextGen Mandate Timeline. NextGen is shorthand for the Next Generation Air Transportation System, and it’s all about tapping into the technology available in our digital age to make air travel and communications safer and more efficient. Shifting from a ground-based air-traffic system to a satellite-based system will give air-traffic controllers (ATCs) greater ability to track and communicate with aircraft. Monitoring aircraft over land and sea will result in shorter, more direct routes (reducing fuel consumption and saving time) and fewer delays. When ATCs can see and communicate with all of the aircraft in their airspace, they can put the aircraft closer together so fewer aircraft will stack up on runways, awaiting takeoff. When you consider the cost of upgrading your avionics equipment and are tempted to take advantage of the exemption, be sure to weigh the following factors. And keep in mind that you’ll usually be flying oversea routes at night. Transitioning the safety of the skies from ground-based tracking systems to satellite-based systems of air traffic control requires new standards and upgraded avionics equipment.Check our timeline to see what mandates may apply to your aircraft and when.